To state the obvious, Italy's Amalfi Coast is as beautiful as any stretch of coastline in the world, 25 miles of rippling inlets and bays that include the island of Capri and its extraordinary Blue Grotto. To state the obvious, Italy's Amalfi Coast is as beautiful as any stretch of coastline in the world, 25 miles of rippling inlets and bays that include the island of Capri and its extraordinary Blue Grotto. Then there is the way the small towns are cut into the hillsides, defying gravity and common sense. 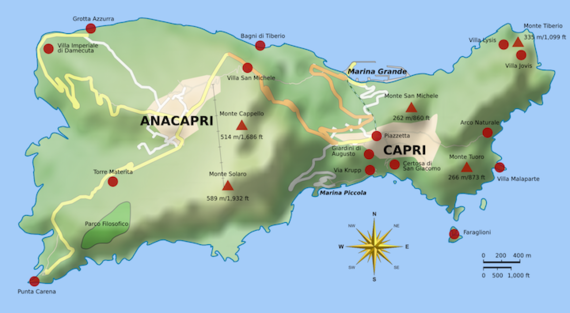 Indeed, to drive along the circuitous coastline itself can be daunting, so the best thing to do is to hire a driver and start out from Sorrento, an absolutely charming small city overlooking the Bay of Naples and Mount Vesuvius. The completely refitted Hilton Sorrento Palace really impressed me on my recent visit for its modernity, its walls of light, its room décor, the numerous amenities, and the quality of the service staff throughout. This is a very popular business travelers' hotel, so the concierge is exceptionally efficient at making restaurant reservations, booking drivers or rental cars, getting train passage, shopping advice, or whatever else you may need. 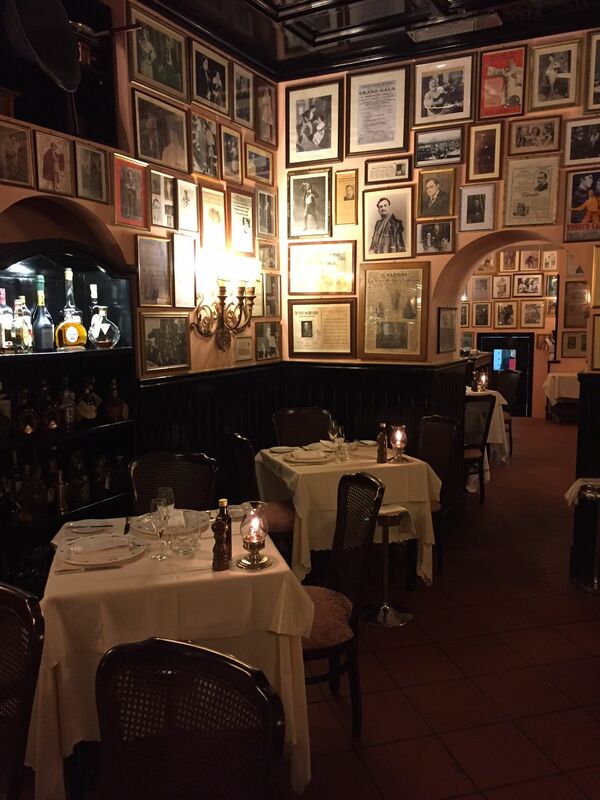 The best restaurant in Sorrento for its seafood is Caruso (above), a veritable museum devoted to the maestro and an enchanting and romantic place to dine in any of the small, cozy rooms. Its langoustines are fat and sweet, its pasta with vongole clams superb. Positano is the loveliest town in the region. Slowly walk down to the center of town, taking in some of the most breathtaking landscapes in southern Italy, passing through corridors of boutiques underneath terraces of jasmine, orange blossom and honeysuckle, finally arriving at a good-sized beach. The restaurants of Positano all have a view and an airy appeal to tourists who descend here like flocks of seagulls. 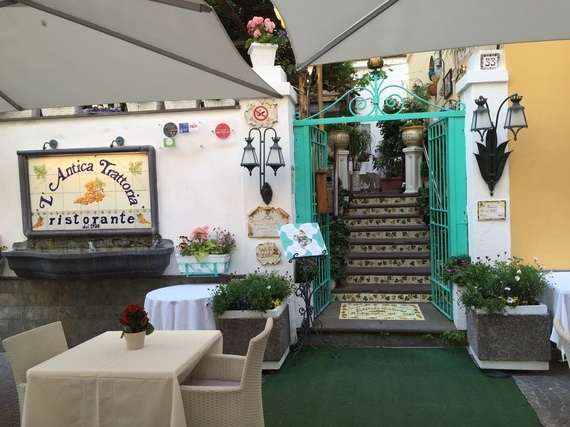 I adore the simple cooking at the very colorful La Cambusa , where I enjoyed a lunch of perfectly fried calamaretti, spaghetti alla position, spinach ravioli, luscious eggplant parmigiana, and a local Campanian wine. 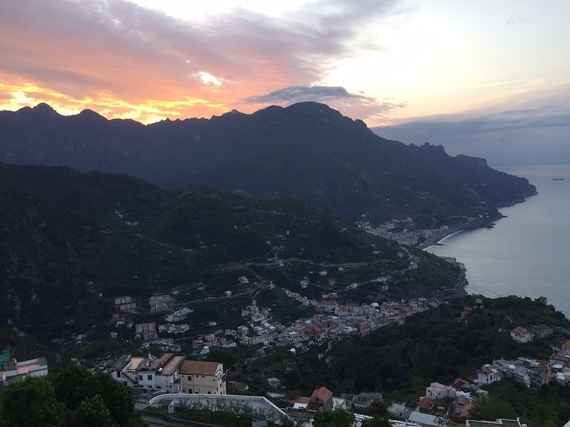 Amalfi is the next large town down the coast, once an autonomous Marine Republic, to which Arab trading partners brought the lemon that goes into the making limoncello liqueur, with slender bottles sold at every shop and stall throughout Campania. 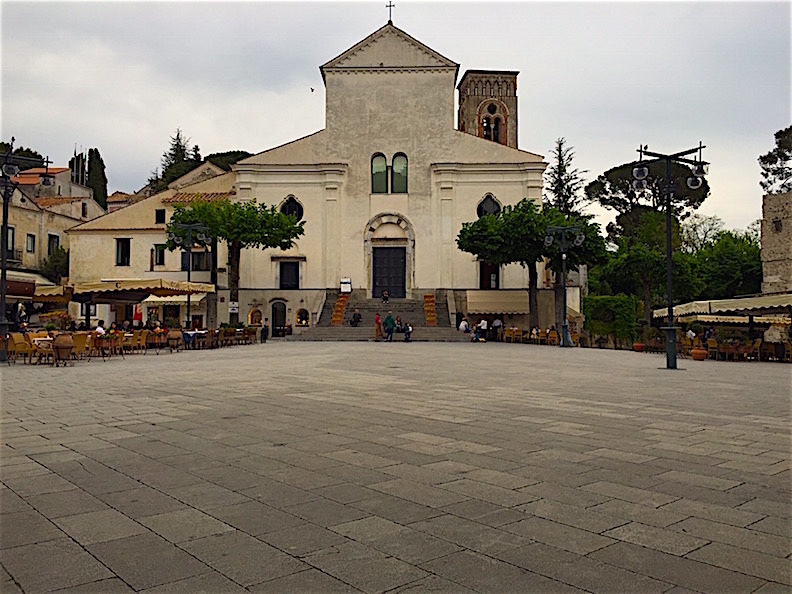 Amalfi has a rather drab seashore, but once through the great arch, you'll find the town square opens up to the sky and is dominated by the 11th century cathedral of Sant'Andrea styled in both Byzantine and Norman elements, perhaps best known for its exterior staircase where once penitents would climb on their knees. The squiggly, winding road to Ravello be treacherous, but once you are at the top, however, Ravello is an oasis of calm after the bustle of the other tourist-ridden towns along the coast. You take a deep breath of good Mediterranean air, stroll through the sedate piazza and visit the 13th century Duomo and Church of San Giovanni del Toro. Then a walk to the peaceful Villa Rufolo, which inspired Wagner to write his opera Parsifal. Virginia Woolf, D.H. Lawrence and André Gide all stayed here, and Gore Vidal lived secludedly in the town for decades. Its archways, gardens, and view of the sea are exquisite, as are many of the outdoor works of art throughout. 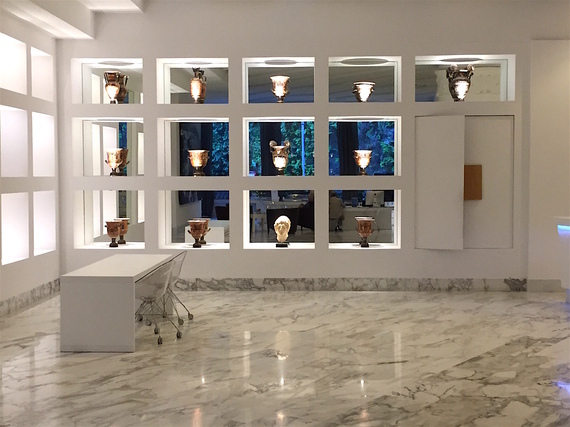 This year I checked into the beautiful, lavish Belmond Hotel Caruso, which underwent a four-year restoration by Federico Forquet that has resulted in hallways and parlors, suites and gardens of exceptional elegance, its designs echoing that of Ercolano and Pompeii. The excavation work turned up frescoes from the 18th century, and there is not a square inch of the Caruso that does not draw the eye to color, fabric, texture, artwork or light; three types of patterned tile are used throughout the hotel. With just 50 rooms, all with glorious views of the water, there is a feeling of blissful privacy, and at dawn the strata of purple and golden light flood the hillside as the white houses with red tile roofs come into view. The Caruso's rooms are very large, decorated with antiques in keeping with the building's aristocratic history of the d'Affitto family dating back to the 11th century. 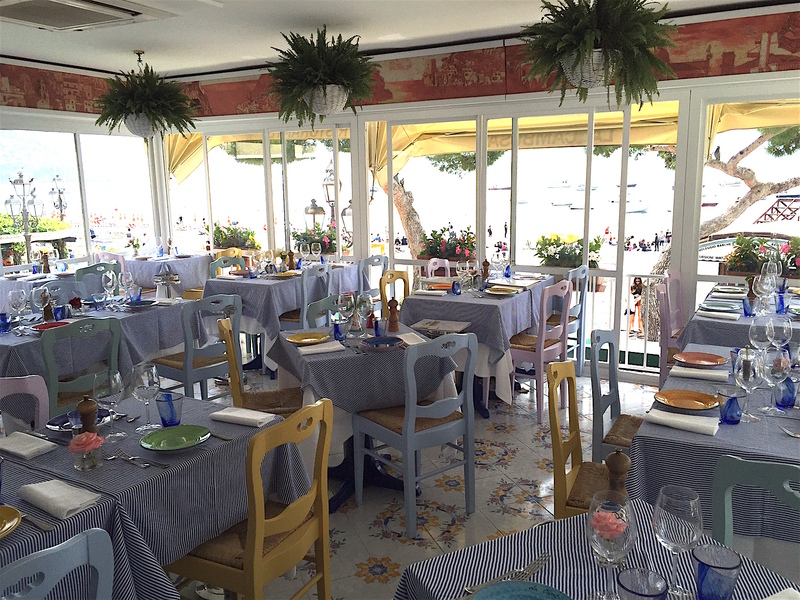 The Belvedere Restaurant features a menu of la cucina novella with strong Campanian roots. The pool is the finest in the region (below). One added advantage of staying at the Caruso is that you can spend a few days here while easily exploring the Amalfi Coast because the hotel offers a jitney service several times throughout the day down to Amalfi. And then there's Capri, one of the most breathtakingly beautiful islands on Earth, but now so overwhelmed by daytime tourists that one has to escape the main town to appreciate the island's true character. Once in the upper town you may spend an hour or so going up and down the circuitous little streets that wind back to the main Piazza Umberto I where it is the custom to have coffee or drinks while looking at all the other tourists. 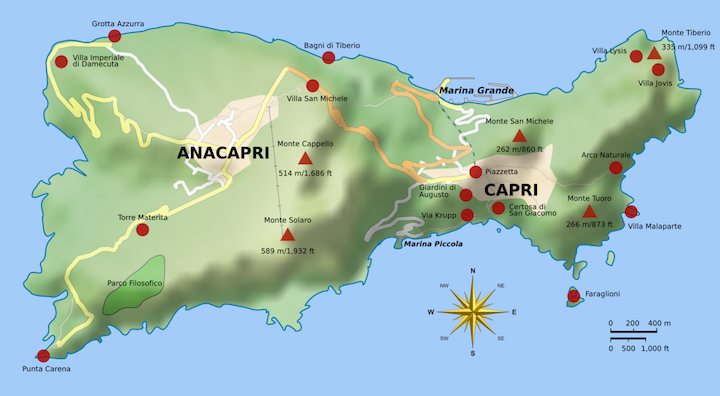 If you're smart, you'll get out of town and take the chairlift to Monte Solaro for a spectacular view, or walk slowly on the lovely one-mile long Via Tragara, each step revealing more sublime seascapes that include the three massive rock formations called the Faraglioni and the ruins of Tiberius's Jovis Villa. The Blue Grotto is well worth your while, if you have time, so book in advance; boats in the Marina Grande advertising trips throughout the day.